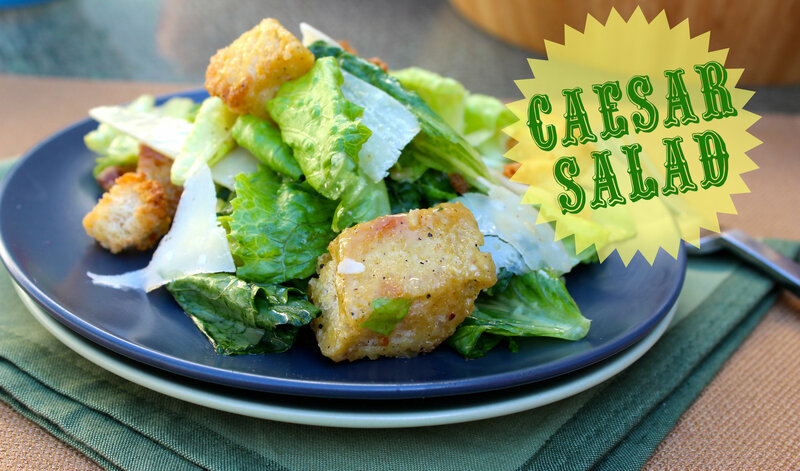 All Hail Caesar salad! Most people agree the Caesar salad was invented by Caesar Cardini in his Tijuana restaurant, opened during the 1920s to circumvent Prohibition laws. The Hollywood in crowd appreciated Cardini’s flare for the dramatic. Cardini himself would prepare the salad table side with a flourish. 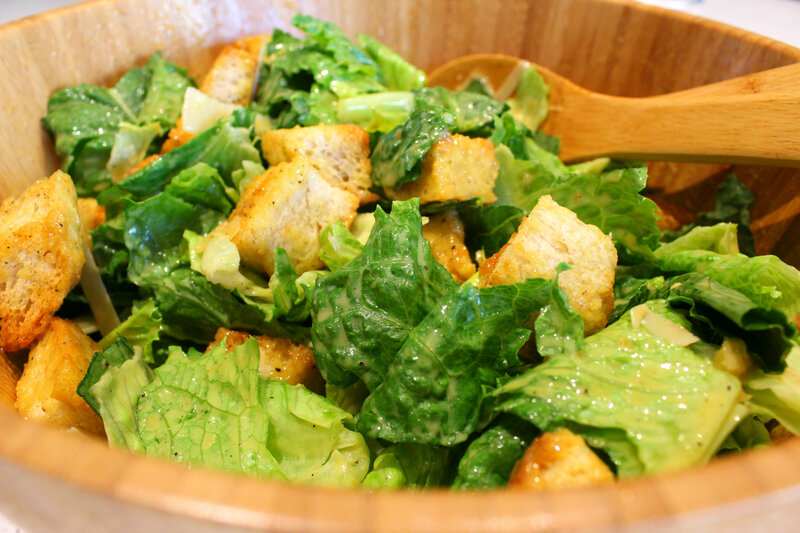 The Caesar salad soon became a national and international hit! The great debate rages on: anchovies or no anchovies? Many cooks and food experts debate about whether or not to include anchovies in Caesar Salad. Some critics say the original Cardini recipe did not include anchovies, but instead used Worcheshire sauce, which also contains anchovies. 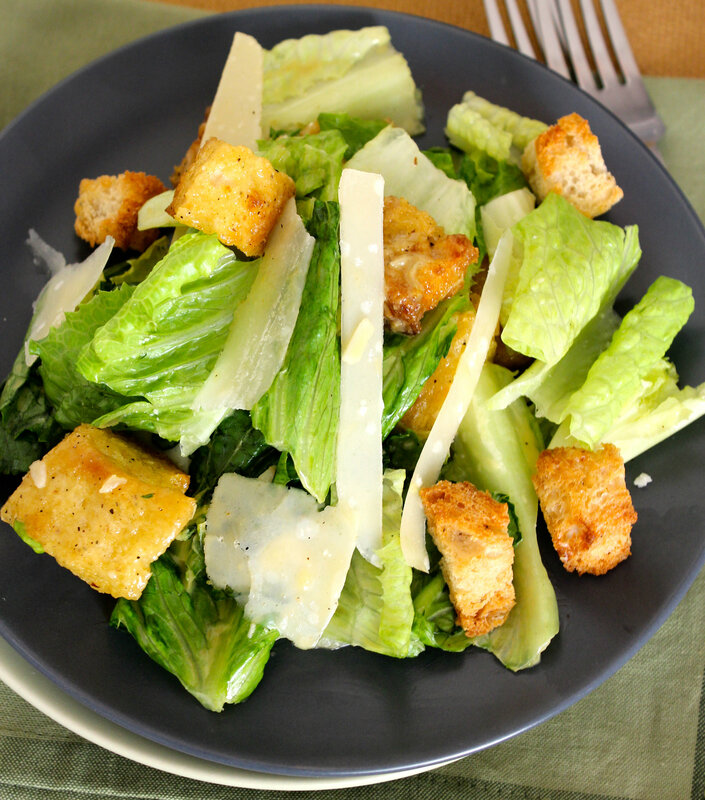 However, others believe that the best Caesar salad include anchovies, and it’s just not a Caesar without them! We believe the secret is not to add too many anchovies. The anchovies give the salad a nice subtle savory note and we promise, our recipe is not the least bit fishy. If you’re having a party, you can serve the salad on a large platter, or prepare and serve it out of a large wooden bowl, just like Caesar Cardini did in his restaurants. But if you want to try something fun, make it portable for a picnic by serving it in individual mason jars. Enjoy the salad by itself, or add chicken or salmon for extra protein. Caesar salad is a great option for lunch or dinner or as Chef Terri prefers for brunch– preferably with a Blood Mary cocktail! In a large salad bowl, add the smashed garlic cloves and anchovy fillets. Using two forks, smash and rub the cloves and anchovies with a pinch of salt to create a paste. Add the yolks one by one and whisk to combine with the garlic. Add the lemon juice and Worcestershire, whisking to combine. Slowly drizzle the olive oil while whisking constantly to create an emulsion. Taste and adjust seasoning with salt and pepper. Tear the romaine lettuce leaves into bite-sized chunks directly into the bowl with the dressing. 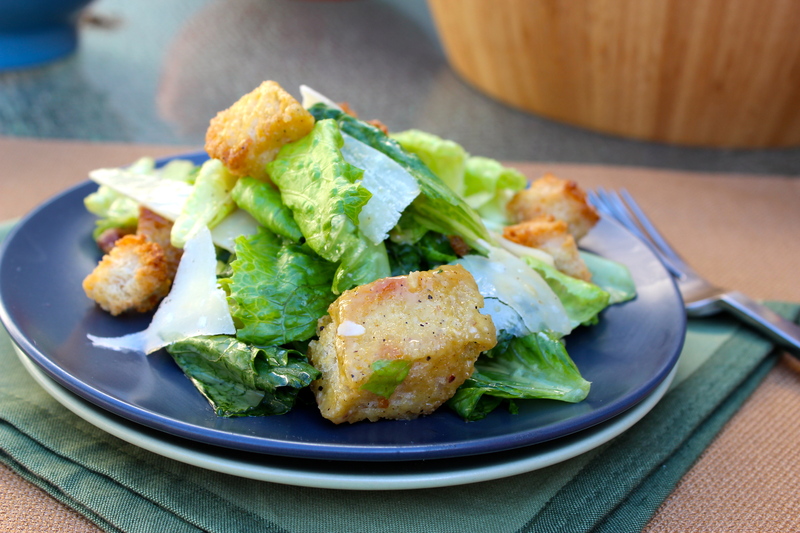 Toss together with Parmesan cheese and croutons. Garnish with freshly cracked black pepper and serve immediately. * to coddle the eggs, place the eggs in a small saucepan. Cover with water and heat to just before simmering. Use immediately. Note: Consuming raw or eggs may increase your risk of foodborne illness, especially if you have certain medical conditions. Make sure your eggs are fresh and stored in the refrigerator. Coddling the eggs will eliminate any bacteria that may be present on the surface of the shell, but will not completely render the egg yolk 100% safe. In a large mixing bowl, toss the bread cubes together with the olive oil, salt and pepper. Spread the bread cubes in one even layer on a sheet pan lined with parchment paper. Bake in the pre-heated oven until golden brown, about 9 minutes. Remove from the oven and allow the croutons to cool. If ever there was a quick and easy pasta dish to make for dinner, this is it! Many thanks to Pat, whose blog, Rantings of an Amateur Chef so graciously published Chef Terri’s recipe and photos! We had a great time making this dish for Pat’s blog! Pasta a la Puttanesca is literally named “pasta in the style of a whore.” Why it’s called the pasta for puttanas, I’ll leave it up to your imagination; however, I choose to ignore its impolite connotations and keep all of the ingredients for this dish at my fingertips in my pantry at all times. The important ingredients for this sauce are crushed tomatoes, olives, red pepper flakes, shallots or onions, garlic and olive oil. For the piquant briny/salty notes, you can add anchovy paste or chopped capers (if you wish to make it vegetarian). Everything but the kitchen sink . . . La Cucina literally translates as ”the kitchen” in Italian. It is also used in the Marche region as the colloquial name for a dish of mixed sautéed greens that includes whatever you have on hand. This sautéing method works well for a wide variety of hearty greens. The dish works best if you use a combination of mild and bitter greens. Mild varieties include: beet greens, chard, kale, cabbage, and spinach. Bitter varieties include: chicory, dandelion, and mustard. Dinosaur Kale, or Tuscan Kale grows in abundance locally here. The lush, dark green, bumpy leaves are super-nutritious: a cup provides more than 100% of the daily value of vitamins K and A, and 88%of the DV for vitamin C. Like other members of the cruciferous family (cabbage, collards and Brussels sprouts), kale is a rich source of organosulfur compounds that have been linked to cancer prevention. Lucky for us, it’s easy to grow in our climate and can be found everywhere — green grocers, farmers markets and supermarket stores. We like to pair this dish with a side garlicky beans for a satisfying, comforting supper. *Be sure to hit the blue links to see the helpful videos we’ve made to guide you through the recipe. As always, check us out on Vimeo or subscribe to our YouTube channel! Heat the olive oil in a large sauté pan over medium heat and add the stems only. The stems will take the longest to cook, putting them in the pan first will ensure they are ready at the same time the leaves are. Season with salt and pepper and cook covered for 5 minutes. Add the leaves, as many as you can fit at a time, and turn them gently to wilt. Continue adding greens and turning them over until you have added all the leaves. Season leaves with salt and pepper and add the garlic and red pepper flakes and sauté for 3 minutes. Add a couple of tablespoons of water, and cook covered for 10 minutes or until the liquid is gone and the greens are fully cooked. Buy them fresh, still attached to the stalk. They stay fresher for up to a week and a half when still attached to their stem. If you buy them loose in a bag or from the bulk bin, chances are they’ve been trimmed a week ago. They start getting bitter soon after they are cut from the stalk. How can you tell a good sprout from a not-so-good one? Squeeze the head between your thumb and forefinger. The tighter the sprout, the fresher and tastier it will be. If you feel something spongy with a lot of give and take, it’s lost its mojo. Too much air between the leafy layers can only mean bitterness and sadness. Try different methods for cooking: steaming, braising, roasting, sautéing, frying… and see which method works better for your palate. Add yummy aromatics like garlic, shallots, celery or caraway seeds, balsamic vinegar, red pepper flakes or BACON to the recipe. Their complexity complements many different flavor profiles. Find one that fits your palate. As a leafy green, they are downright fluffy and easy to digest. Slice them in thin ribbon-like strips for a quick sauté. They cook so fast this way! Just don’t EVER buy them frozen. EVER. The recipe below is Chef Mia’s, which was inspired by a photoshoot we did one afternoon (pictured above). We liked the look and texture of both halved and sliced that we decided to keep them together in this dish. I actually made this for dinner tonight — and added julienned carrots. Delicious! Take half of the Brussels sprouts and thinly slice them horizontally. Keep the remaining halves in tact. Keep them separate and set aside. In a large sauté pan over medium heat, cook the bacon until brown and crispy. With a slotted spoon, remove the bacon from the pan and set aside. Pour off the bacon grease in a disposable container and discard. In the same pan, heat the olive oil and sauté the halved sprouts. keep tossing the sprouts until their outsides are brown and crispy, about 7-8 minutes. Add the shallots and garlic and sauté 2 minutes more. Stir in the sliced Brussels sprouts, and red pepper flakes and season with salt and pepper. Continue to sauté until the sprouts turn bright green, about 5 minutes more. Stir in the balsamic vinegar and return the bacon to the pan. Taste and adjust the salt and pepper as needed and serve hot.